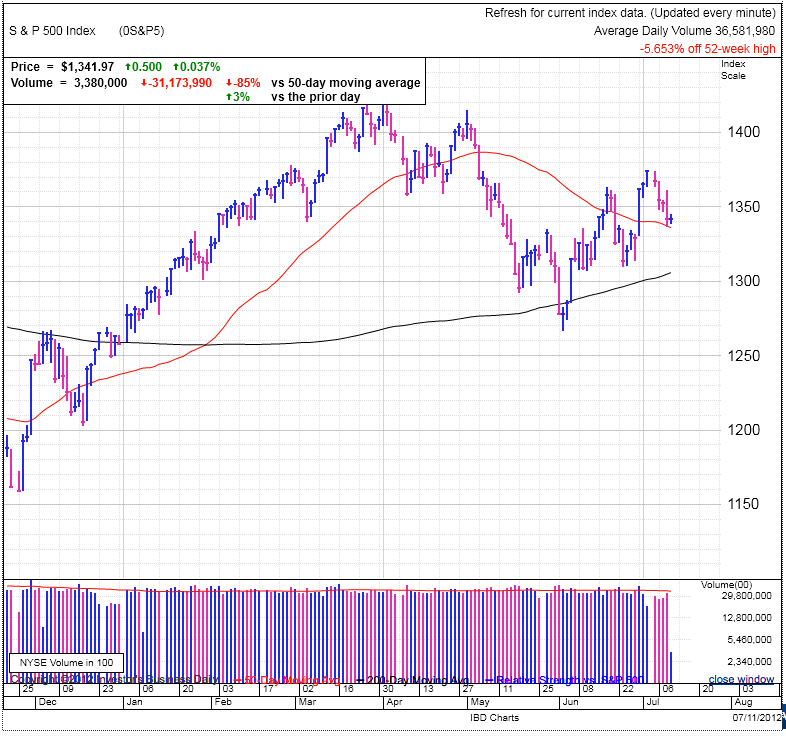 The market is trading in a tight range after yesterday’s dismal close. We’re resting just above the 50dma on the S&P500 and NASDAQ. Drop under this key line and we’ll trigger a wave of stop-loss selling, sending us down to the 200dma. Break the 200 and we’ll push toward June 6th’s low. The way these technical levels line up, we could see a series of dominoes fall in automatic selling if the market gets spooked from here. How quickly the weather can change in the markets. Two weeks ago the market was giddy with excitement as Germany signed off on bailing out individual banks and it shrugged off the Supreme Court upholding Obamacare. But that is a distant memory as almost all current headlines have returned to doom and gloom. Part of the problem facing the markets is the traditionally light summer volume. Many of the senior traders are on summer vacation and this allows the market to drift around listlessly as smaller currents can move the market. This gives us a lot more random noise in the indexes and contributes to the large number of failed breakouts we’ve seen. These minor currents have the strength to push the market up or down, but only temporarily and they quickly reverse. This pattern is extremely frustrating for the breakout trader who is buying a directional move moments before the trend reverses. Yesterday’s sell-off caused IBD to move the current outlook to market under pressure. If this FTD fails, it will be the third failure in a row. But this shouldn’t be a surprise to most because, this summer choppiness is nothing new and the source of the popular saying “Sell in May and go away.” But don’t get complacent if you are trading this market, the lighter volume can also lead to increased volatility because it takes a smaller number of traders dumping their holdings to trigger a big slide. As for how to trade this market, it is really hard to make headway given the choppiness and if you have something else to do, this would be an excellent time to take a break from the markets. A couple of weeks away from the markets will give you fresh eyes and recharge you for the more productive trading season coming this fall.